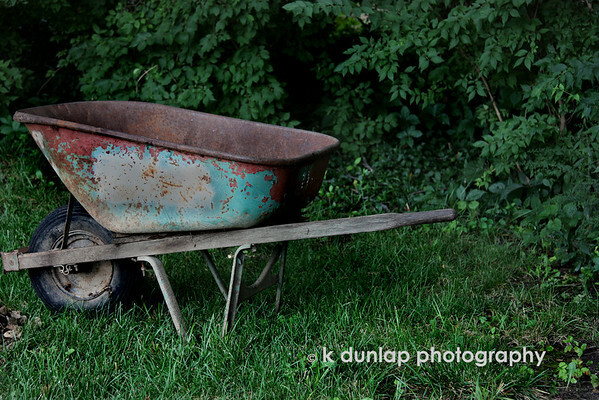 09.10.09 = Even though one handle has broken off, this wheel barrel is still out there doing the job. It makes me think that you have to keep going no matter what. You may not always have the best of things, but keep on going and work with what you've got. Love the photo and the caption too. Great. Like the picture...the quote is great. Okay, I'll give you a big UMPH for this one...nice comp. I thought the photo was good until I read your caption. Wow! Words for all of us to live by. Your caption really brings life to the photo. Thanks for all you share! Nice sentiment to take away from a broken wheelbarrow- you're quite the philosopher lately! Cool find. I have one similar to this. I tried to use it not long ago and it kept me going in circles. Maybe not enough umph?! Nice to see someone else still has green grass. Everything here is looking a little brown already.